The McHale 991B range of round bale wrappers sets the pace for efficient and effective round bale wrapping. The 991 round bale wrapping range features practical design, quality components and precision engineering making the McHale bale wrapping range the first choice for contractors and farmers. Packed with practical and reliable features, the 991BC round bale wrapper is designed with the efficient operator in mind. Round bale wrapper users should look towards the hydraulically operated cut and tie system, the efficient round bale wrapper dispenser, which maximises film usage and the 991B round bale wrappers patented ground supported damper system. Like all McHale round bale wrappers, the high output 991B bale wrapper range will deliver a tightly wrapped silage bale that contains all the natural juices, ensuring increased nutritional value, while improving environmental protection. All McHale 991B round bale wrappers feature the uniquely designed McHale patented ground supported bale damper system. This is one of the most important features on the McHale round bale wrapper range. Only a McHale round bale wrapper will give you a ground supported bale damper, which will gently lower the wrapped round bale to the ground and at the same time eliminate all stress to the chassis of the round bale wrapper. When the rotating wrapping table on the 991B round bale wrapper stops and is raised to the tip position, the heavy-duty bale damper raises to cradle the bale while a second arm is lowered automatically to the ground. The heaviest of round bales can then be gently lowered eliminating any damage. The McHale round bale wrapper range is fitted with a hydraulically operated cut and hold system, which at the end of the wrapping cycle cuts and holds the film in position ready to wrap the next round bale of silage. This time saving device eliminates the need to manually reattach the wrapping film. Uniquely designed, this system, which is fitted as standard on all 991B trailed bale wrappers works reliably and consistently in all weather conditions. The McHale 991 Round Bale Wrapper dispensers lock and load system makes film loading really easy. When removing the core of the used roll the dispenser bobbin locks in place. When a new roll is loaded it can be locked in place by simply pulling the cord. The 991 round bale wrapper chassis and lift arm have been extensively tested over the last 15 years. Many McHale round bale wrappers in the market place have wrapped 150,000 bales and customers have been more than happy with the way this heavy-duty bale wrapper has stood up to the task. The round bale wrapping table is constructed of four heavy-duty belts, which ensure smooth and even bale rotation even when dealing with loose or asymmetric bales. A smooth wrapping seal is guaranteed as the machine delivers a 50% overlap. Shear bolt protection ensures that asymmetric shaped bales do not damage the machine’s gearbox or drive line. The 991BC round bale wrapper comes complete with an autostop function, which means that once the bale wrapping rotation lever is engaged and the bale wrapping process is started the bale wrapping table will continue wrapping the bale until the preset number of table rotations is complete. When the bale wrapping process is complete the table will automatically stop in an offset position so that the bale can be tipped from the bale wrapper table with the simple pull of a lever. The wizard control console monitors round bale wrapper operations on the 991BC round bale wrapper. The operator can set the number of layers to be applied and can monitor the revolutions per minute of the bale wrapping table. The wizard control console also allows the operator to store two job totals. 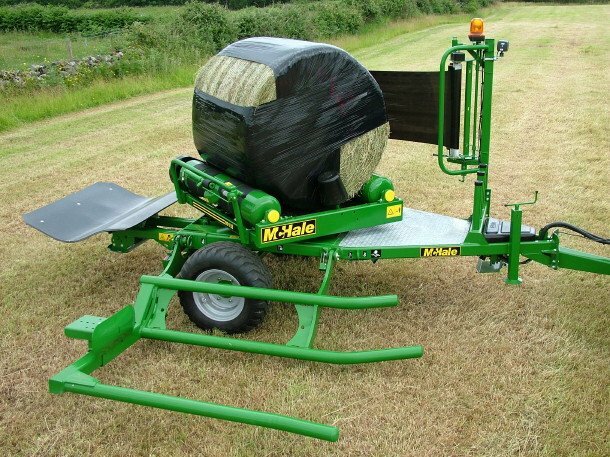 An optional side tip is available on all McHale 991B round bale wrapper models. This allows the machine to eject the bales on their ends after wrapping is complete. it tips the bales on their ends where there is more plastic, thus reducing damage in stubbly fields. it allows the round bales to hold their shape better.